First, one of my goals has been to open a window into the world of Mexican cooking in an accessible way. I’ve introduced basic ingredients and dishes along with bits of their history, fun facts, cooking methods and new spins, so people can become familiar with this cuisine and feel empowered to play with its basics in their own kitchens. No sense in teaching how to make something incredibly complex with tons of new ingredients, which can be quite overwhelming, right? Chiles in Nogada are laborious. They use many ingredients, such as Poblano chiles, plantains, piloncillo and acitrón, that require a proper introduction by themselves or in a simpler dish. Piloncillo in a disk, a cone and shredded. 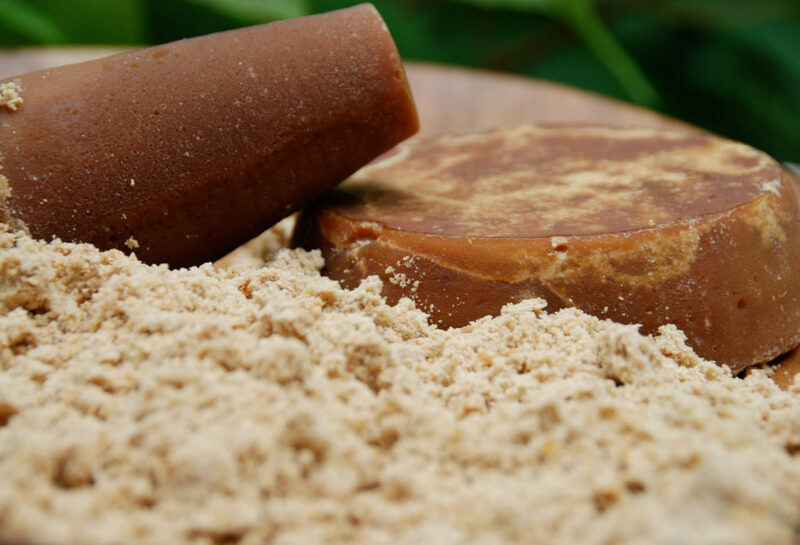 Also called panela, can be substituted with dark brown sugar. Also, Chiles in Nogada look strange. If you are not familiar with them, you see a large green chile overstuffed with an odd looking filling, covered in a pale looking sauce and pomegranate seeds on top. What’s more, they are served lukewarm, which is unexpected. Let me add more. Since they are so rich and complex, they are typically served on their own. They don’t like the company of much more than white rice or a freshly favored water…. All this said… I am making them for my next class!! Let me tell you how this came to be. To start with, the topic is Celebrating Independence Day with Frida Kahlo and Diego Rivera. Chiles in Nogada are the quintessential dish eaten throughout the country on this day, and for the whole month of September. It is is a symbol, although there are many versions for how they came to be (ladies in waiting celebrating a military victory, young nuns welcoming a famous presidents, and a people’s way of celebrating the seasons’ bounty) they all agree it was created with the colors of the Mexican flag in mind: green chile, white walnut sauce and red pomegranate. Other years, I had gotten away with making other dishes prepared for this holiday that aren’t so labor intensive and just as good. However, the second part of the topic made it harder. Frida and Diego, one of Mexico’s most iconic figures who embody Mexicanidad and they ate Chiles in Nogada during this holiday. And believe me, I thoroughly researched, trying to find other things they also ate then!! The last straw came when Humberto (coordinator at the Institute) sent me the proof for the invite for the classes. The cover? Chiles en Nogada. I wasn’t going to change something that had hours of work involved already. And yes, Chiles en Nogada are such a staple. And…OK! If they are in the cover, I have to make them. So with the fear of not wanting to scare away our guests with such complex dish on the back of my mind, I set on a quest to find the most delicious recipe. Remembering how every year I, along with millions of Mexicans and Mexican food aficionados, await for September to be able to eat this deliciously extravagant dish, I had to find the best version to share. I began by making the version I grew up eating made by my nana, who gave me detailed instructions over the phone. Then I tried my mothers’ sophisticated take. Then I compared the two, and even mixed things of one into the other (oh sacrilege! the eternal culinary competition of my memories). Then I made Guadalupe Rivera’s version (Diego Rivera’s daughter), followed by Diana Kennedy’s… and any other I could find. Misery! I could not get the exquisite result I remembered savoring time and again. Frustrated, as she saw me, Alejandra de la Paz (Director of the Mexican Cultural Institute) contacted Don Luis Bello Morin, director at the Restaurant of Palacio Nacional de las Bellas Artes in Mexico City. It took no more than a couple hours for him to respond with a recipe which included possible substitutions for hard to find ingredients and a detailed guide to make them. His instructions were so precise, that it was like having a co-pilot throughout the ride: he described the minutes, the smells, the sounds and textures to be found through his tested road to make the best ever Chiles en Nogada I have ever tried. Not only was he so generous to share his recipe, but the results went beyond my expectations. Since he loves to share recipes so that dishes such as this will not be lost, here is his adapted recipe (since the one he sent is for an industrial quantity). Thank you Don Luis! As for my hesitations: I can’t wait to share this recipe and all the stories I’ve gathered for next class. In hindsight, I have been so pleasantly surprised with the eagerness of participants to eat and cook many more things than I would have expected. Of course, Chiles en Nogada are at the end of labor intensive spectrum, but they are so worth it. Now, if you feel like making this recipe, let me know how it turned out. If you don’t and really want to try it, come to my next class! To prepare chiles: Rinse and char chiles. To char, you can either place them on a baking sheet or pan under the broiler, directly on the grill, hot comal or directly on an open fire flame. In any case, turn every 2 to 3 minutes until they are charred and blistered but not burnt. Place them, while very hot, in a plastic bag. Close bag tightly and cover with a kitchen towel. Let them sweat for 10 to 20 minutes. Take them out one by one, and peel off the skin in the sink. As you do so, lightly rinse the chile with water. With a knife, make a slit down one side to take out and discard the seeds and membrane. Treat the flesh carefully so it will not tear and keep the stem on. Place them in a container and cover with the water previously simmered with the piloncillo or sugar until well diluted, anywhere from 2 to 24 hours. If it is more than 2 hours, place them in the refrigerator, covered once they have cooled down. Drain and either use or store in the refrigerator. You can prepare them 4 to 5 days ahead up to this point. To prepare filling: Place the meat already cut into 3 to 4" chunks on the bottom of a cooking pot along with the garlic cloves, 1/4 white onion, carrot, bay leaves, thyme, peppercorns and a teaspoon of salt. Cover with water and place over medium high heat. Simmer for 20 to 25 minutes, until meat is cooked through. Turn off the heat and let the meat and broth cool down. remove the meat with a slotted spoon and chop it finely, reserve. Strain the broth into a container, reserve. Heat the olive oil in a large deep saute pan over medium high heat. Add the garlic clove and saute for a minute or until it starts becoming fragrant, but don't let it brown. Add the onion and saute for a couple more minutes, until it becomes translucent and soft and starts gaining some color. Pour in the tomato puree and let it season, stirring often, for about 5 to 7 minutes, until it has deepened its color, thickened its consistency and lost its raw flavor. Incorporate the chopped meat, 2 cups of cooking broth, a teaspoon of salt, mix it all together and let it cook 3 to 4 minutes. Add the chopped acitron, mix with the meat and let it cook for 4 to 5 minutes. 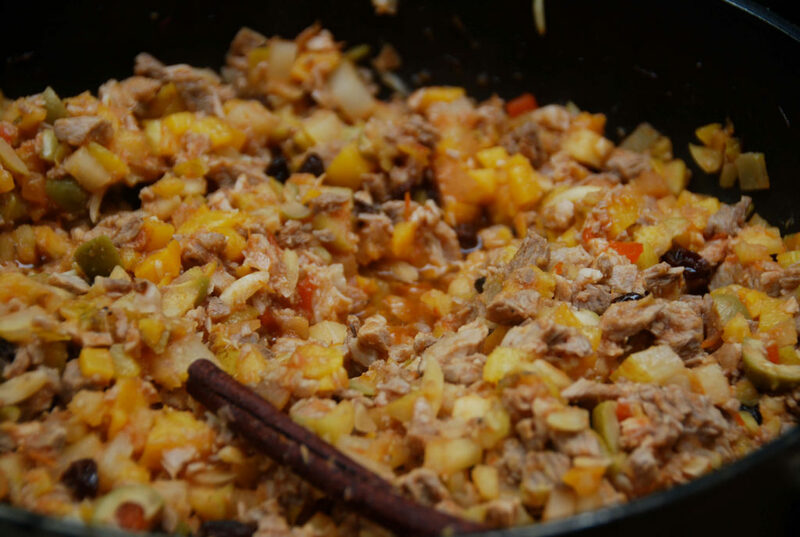 Incorporate the chopped plantain, pear, apple, and peach and gently mix it all together, let it cook for a couple minutes. Sprinkle the cumin and ground cloves, making sure you mix those spices well. Place a cinnamon stick in the middle of the pan, cover with a lid, lower the heat to medium and let it cook for about 8 to 10 minutes. Uncover, add the raisins, almonds, pine nuts, green olives, mix well and taste for salt. Add more if need be. Turn off the heat. You can make the filling up to 2 days in advance, cool, cover and refrigerate. To prepare sauce: Place all ingredients except the Sherry in the blender and puree until smooth. You can make the sauce a couple days in advance, but bring it to out room temperature before using. Mix the Sherry into the sauce up to 2 hours before serving. Add more to taste, but it shouldn't have a strong alcohol flavor. If it thickened while in the refrigerator, lighten it up with some milk. Finally!!!! To assemble Chiles en Nogada: Place the chiles in a serving platter. Stuff each one with about 1/2 cup filling. Close as best you can. Generously spoon walnut or pecan sauce on top to cover chiles entirely and sprinkle with pomegranate seeds and chopped parsley on top. NOTE: Some cooks batter and fry the chiles before adding the sauce. But that version is much heavier and has become less and less popular over time. where can i find the recipe for the barbacoa you made on one of the shows, that one you used plantain leaves and avocado leaves. Here you go, Sandra: https://patijinich.com/beef-barbacoa-sliders/ Enjoy! Just want to say hi & tell you how much I enjoy your site & recipes! I made these last night & they were amazing!! Was craving Chiles en Nogada for awhile & these were perfect! Hummm… And my hubby and I still struggle making Chili Pobolanos… I could leave a pic of our last effort, but we would be laughed off planet earth!! Hi Pati – I’m about to try this recipe for a dinner party and I have a question. It’s my understanding that this should be served luke-warm…if I have prepared and refrigerated everything ahead of time should I simply remove all of the separate pieces from the refrigerator a certain amount of time before dinner and allow them to come to room temperature or can I assemble and then heat up in the oven for a short period of time? Any advice? Gerat idea to prepare ahead of time. Just bring out to room temperature and assemble before serving, Should be delicious! Mil mil gracias! Seguramente saldran delciosos,pues todo lo que he preparado tuyo esta exquisito! Compre tu libro y la recetas que subes a Facebook imediatamente lo guardo en Pinterest. Gracias por mostrarle a este pais lo bien que se come en mi Mexico!!!! mil gracias por esta receta. Siempre he querido aprender a hacer los chiles en nogada! Estoy segura que estaran deliciosos!!! Todas las recetas tuyas salen riquisimas ya que he preparado varias! Compre tu libro y lo que pones en Facebook enseguida lo pongo en Pintrest. Mil mil gracias por proporcionarme tanta receta de mi Mexico. i just heard you on npr, sharing the story of the day of the dead & yummy sounding related recipes, which i’m eager to try. i even have some beautiful clay heads, often used on the pan de muerto, which i brought home from mexico years ago,and it will be great to use them,as intended. i’d love to make the pumpkin mole but my son-in-law is allergic to all orange/yellow vegetables & fruits!? is there anything i might substitute that would come anywhere close? close? if you’re wondering why i’m on the chiles en nogada site,i was delighted to learn of you & loved your cheery enthusiasm and obvious knowledge on the air. so i immediately went to your blog & had to see if you had anything on one of my most favorite dishes of all time. i have made it and it is complicated indeed and worth the trouble. i can’t wait to try your version. you might share with your followers that if they live in a city with a trader joe’s, they almost always have fresh pomegranate seeds in their produce dept all year round. what city do you live/teach in and when is your food show on the air? Thank you Bonnie! And so glad to hear about the pomegranate seeds being found all year in Trader Joe’s. Depending on where you live, what time your local public station will air my show… can you send them an email or call to ask? You can also look into their website. It does air nationally! I just returned from my first visit to Mexico and one dish that sent me in search for more was Chiles en Nogada. As with most dishes, there are many versions and I have been scouring the internet seeking a recipe that would replicate the wonderfully complex flavours I first encountered. Just reading the ingredients in your recipe conjures up smells and flavours that assures me this is the one! I have yet to find poblano chiles in my small town and wonder if I could substitute with the common green pepper? Also, is it possible to freeze the filling? … it would nice to have some in the freezer should unexpected guests arrive. Thank you for your generosity in sharing this recipe. Thank you for sharing this recipe! 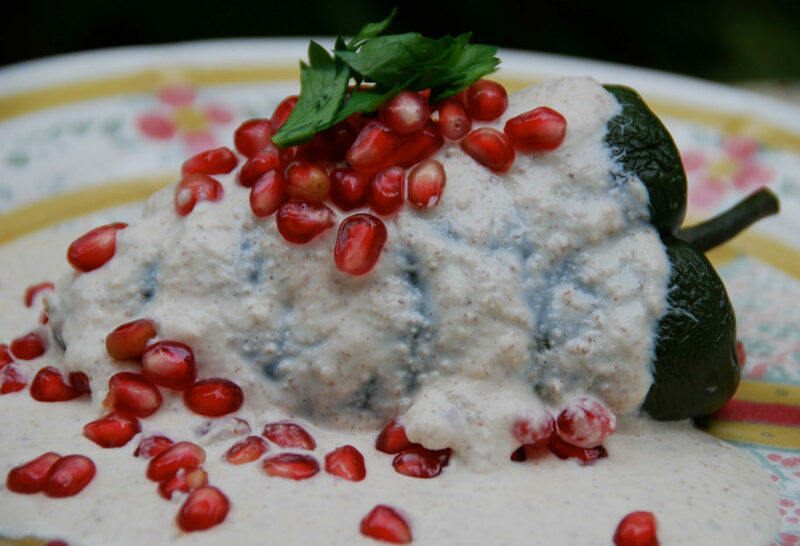 I had the pleasure if experiencing Chiles en Nogada in Mexico DF years ago, but have never been able to find a good recipe to recreate that experience. My boyfriend and I love to cook, and he is always interested in the most complex recipes possible. 🙂 We are excited to make this dish together! Love your show. Thanks again! Hi Nicole, I’m so excited that you have chosen to try my recipe!! I hope it does bring back memories of Mexico City for you. Patty, vivo acÃ¡ en Columbia MD y me puedo relacionar perfecto con tus historias y sabores viniendo de Mexico. Este año voy a hacer el pollo con tamarindo para Rosh Hashone. QuerÃ­a come tarte que ñara hacer los chiles en nogada yo normLmente los meto en aceite hirviendo un par de minutos y luego los sudo y pelo. De esta manera no se me hacen aguados y conservan su forma. Tu que opinas de este método? Me podrÃ­as avisar cuando vayas a dar alguna clase porfavor? Hola Paty, buscando una receta me encontre con tu maravillosa pagina de internet, de hecho llevo alrededor de dos horas continuas leyendo los articulos y recetas tan maravillosas que nos compartes, quiero comentarte que soy una apasionada de la cocina mexicana , siendo yo misma mexicana tengo años dandome ala tarea de investigar muchos de nuestro platillos, por que siento que en Mexico estamos perdiendo el amor por nuestros platillos de origen, hoy en dia se hacen muchas variaciones, no creo que sea malo sino que simplementevan resagando las recetas autenticas, gracias a dios he tenido la oportuidad de viajar a divrsos pueblitos de nuestra republica , donde me he acercado ala gente de la region (indigenas) y he aprendido cosas maravillosas que aun guardan la escencia de nuestras raices, desde como hacer una tortilla, una salsa, un mole o preparar una cecina..no hay mas que maravillarse ante la sabiduria , cultura y sazon de estas mujeres, que sin saberlo hacen preseverar nuestras raices culinarias, bueno te comento todo esto por que he leido varias recetas de tu blog y son increiblmente maravillosas y apegadas a las recetas autenticas..pero en cuestion a los chiles en nogada que supongo por lo que se lee es uan receta deliciosa,pero a mi ver dista un poco de la receta autentica..me encantaria compartir contigo la receta que me compartio una mujer NÃ¡huatl,creo que te encantaria..espero y no sientas que minimizo tu receta, por el contrari creo que es maravillosa, pero como comentas que te gusta la investigacion pense que te agradariatener esta y saber la historia que se me conto de ella..te envio bendiciones..y agaradesco infinitamente tus recetas..salvaran mis dias de tedio ante no saber que hacer.. un abrazo..
queria preguntar si tienes en venta un libro con las recetas ? y como podria obtenerlo? gracias!! This is one of my all time favorite recipes. Friday I went to Pete’s Market and as I was walking in there was a huge bin of these great looking Poblanos at a great price. Seeing them brought back memories from when I made your recipe for Chiles en Nogada in the Fall of 2009. I made them for a dinner party which brought together three families for a Saturday (after Thanksgiving) dinner party. They turned out absolutely delicious and exactly as I remembered them from my visit to La Fogata Restaurant in San Antonio (highly recommended, by the way) when I was there for a family reunion earlier in the previous summer. (By the way, La Fogata uses pecans in their cream sauce.) Well, on impulse I bought a bunch of Chiles. Since I did not save your recipe I had to do a Google search, and finally found it on the 4th or 5th page. This time I am bookmarking this page and saving this recipe so I don’t lose it again. Thanks for sharing! It is worth all the work to put this together. So thrilled you liked it! Your best bet with the pomegranates is if you still find some, freeze them whole, without peeling them at all. Or ask your grocer, sometimes they save some frozen. Then you can thaw whenever you want to use and they remain in great shape. As for the sweetness of the dish, you can tone it down in many ways: leave out the candied pineapple, reduce the amount of raisins as well as the sugar in the sauce. No need to thank, it is my pleasure! I just wanted to thank you for this wonderful blog, and in particular, this spectacular recipe. I made this recipe (using pecans and candied pineapple as substitutions) a few weeks ago for a dinner party and I received the most generous complimets because of it. In addition, I’ve been asked to make it again and again. It is most definitely going to make it into the family recipe book. Thanks! I am so glad!!! Many thanks for your lovely message. Quiero que sepas que apenas me enteré hace poco de tu blog!!! Es EXTRAORDINARIO!!!!!!! Escribes precioso y cómo no vamos a querer probar tus recetas??????? Aquél molcajete que pasó por Toronto, seguro se ha puesto a buen uso!!! Siempre he querido hacer Chiles en Nogada y ahora, guiada por tu deliciosa receta, me voy a atrever!!!! Te felicito, y ya tienes a una seguidora mÃ¡s!!!!!!!!!!!!!!!! Muchas gracias Betty, que gusto encontrarte por aquÃ­! Visitame por aquÃ­ seguido y dime que anotojos tienes, que cosas extrañan, que escribiré sobre ellos…. Muchos saludos, desde DC! Thank you for providing this recipe! I spent a month in Puebla last year during chiles en nogada season and was delighted when my host mother made them for a party. I wasn’t able to get a good recipe while I was there, so I’m really excited to get to try this out. My question: are skinless (walnuts) readily available in the DC area? Granted, I haven’t looked for them yet, but one of my Poblano friends said that they’re not common in the US. If not at a higher-end store (Whole Foods, Harris Teeter), are they at one of the latin markets? So nice to get your message and so excited that you will try this recipe out (it truly is spectacular!) I haven’t seen fresh skinless walnuts anywhere around here. But if you can’t find fresh walnuts to peel (which, yes, are laborious to peel.. ) don’t use the already peeled and packaged walnuts because they will give a bitter taste to the sauce. Not good. Just substitute with pecans. You get very similar taste as with fresh walnuts, just as a delicious sauce, and the only difference is that the sauce will not be sooo white. Let me know how they turned out! Wish we lived close by to come to the class, hear the stories and try those chilies! Can I make them ahead of time and refrigerate?